This has been a very successful day’s walking, covering relatively flat terrain that allowed Carolyn to move at an extremely tidy pace. 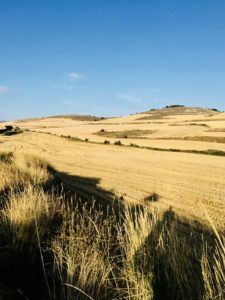 Consequently, we arrived In Castrojeriz at 1.15 – by some distance the earliest arrival at our destination so far ( admittedly it was only 20km, but we must always embrace the positive). Consequently, we wandered round in circles looking for our hotel, asking directions in our remarkably sub standard Spanish. One man attempted to explain the situation to Carolyn, i.e. that you had to check into the hotel at the bar/restaurant. With hindsight she realised that he was offering to take us round to the bar, but at the time had decided that what he was actually saying was “You don’t want to stay in that hotel. I can take you to my much nicer and cheaper hostelry.” While trying to get directions from a woman, all I could hear in the background was “But we have already paid for this hotel. We cannot stay at yours. I’m sure it’s lovely, but we must find the Hotel La Posada de Castrojeriz!” The man was clearly thinking “Why bother? 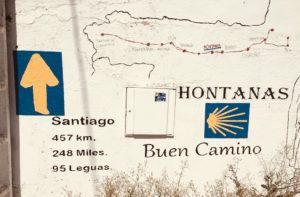 These foreigners will never make it to Santiago. It’s a miracle they got this far”, before strolling off and leaving us to stew. Two further sets of directions later we reached the bar and were escorted to our very nice, very old 15th century hotel. We dropped our gear, went straight back and had a delicious lunch with liquid refreshments in the restaurant section. Delicioso. 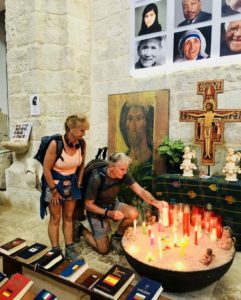 Today’s stage took us through the hugely attractive village of Hontanas, whose church, Santa Brigida, actually provided real candles that you could light. 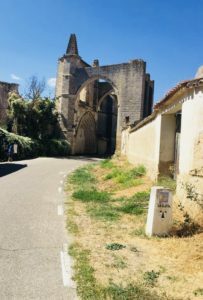 There wasn’t really anything else between there and our destination save the ruins of the Convent of San Anton, which were reasonably interesting as ruins go. 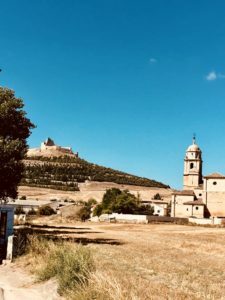 Within next to no time we found ourselves on the outskirts of Castrojeriz, entering the Colegiata de la Virgen del Manzano (another church : “Virgin of the Apples” – it was a very churchy day) which also had real candles you could light yourself! Wonderful. The sun shone throughout, and it was, all in all, an excellent day. Today’s album track is “One Love” by David Guetta featuring Estelle. 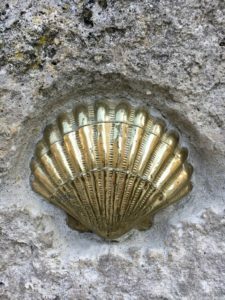 (Carolyn’s choice – I am not familiar with the works of these fine individuals), to thank everyone for their kindness and support over the last ten plus years. I got through an entire blog without mentioning Carolyn’s foot! Hang on…….Damn…..